Achondroplasia is the most common cause of rhizomelic (root/proximal) short-limb dwarfism. Patients are of normal intelligence. 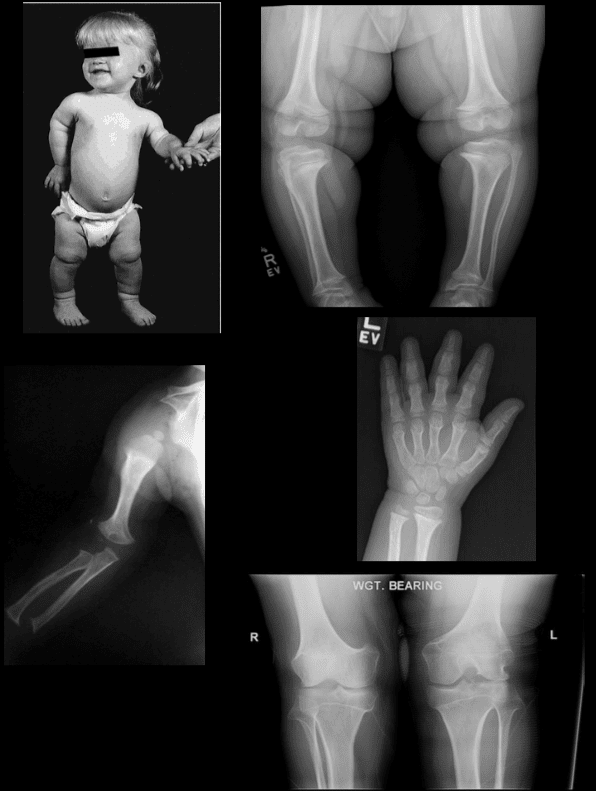 It shows multiple distinct radiographic abnormalities affecting long bones, pelvis, skull, and hands. Vertebral column changes may present with significant clinical and neurological abnormalities. Achondroplasia is an autosomal dominant disorder with about 80% of cases from a random new mutation. Advanced paternal age is often linked. Achondroplasia results from a mutation in the fibroblast growth factor gene (FGFR3) which causes abnormal cartilage formation. All bones formed by endochondral ossification are affected. Bones that form by intra-membranous ossification are not normal. Thus, skull vault, iliac wings develop normally vs. the base of the skull, some facial bones, vertebral column, and most tubular bones are abnormal. Dx: is usually made at birth with many features becoming apparent during the first few years of life. Radiography plays an important part of clinical diagnosis. Typical features include: shortening and widening of tubular bones, metaphyseal flaring, Trident hand with short, broad metacarpals and proximal and middle phalanges. Longer Fibular, Tibial bowing, markedly short humeri often with dislocated Radial head and elbow flexion deformity. Spine: characteristic narrowing of L1-L5 interpedicular distance on AP views. Lateral view shows shortening of pedicles and vertebral bodies, “bullet shaped vertebrae” can be a characteristic feature. Early degenerative changes and canal narrowing occur. The horizontal sacral inclination is an important feature. Skull demonstrates frontal bossing, midface hypoplasia and markedly narrow foramen magnum. Pelvis is broad and short with characteristic “champagne glass” pelvis appearance. Femoral heads are hypoplastic, but hip arthrosis is normally not observed even in older patients likely due to reduced leverage and lightweight (50kg) of patients. 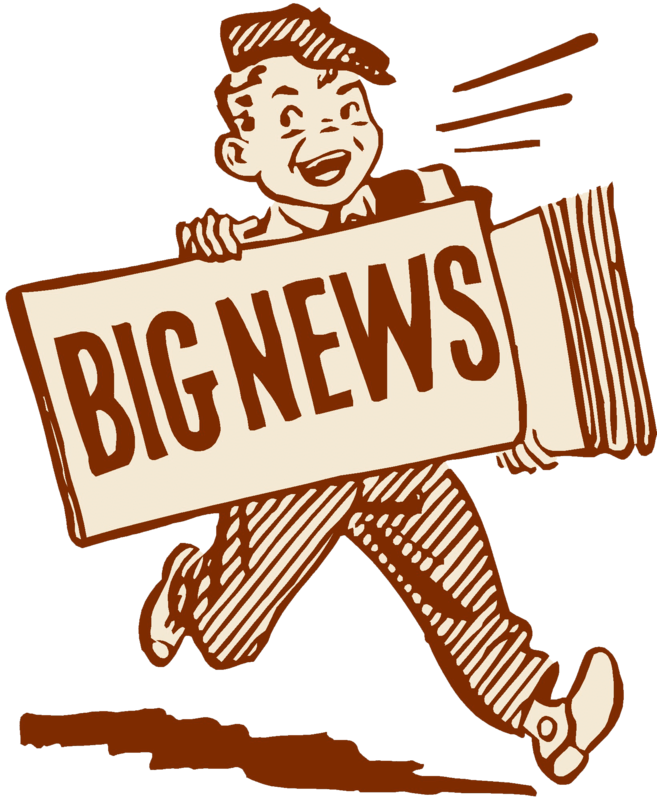 Recombinant human growth hormone (GH) is currently being used to augment the height of patients with achondroplasia. 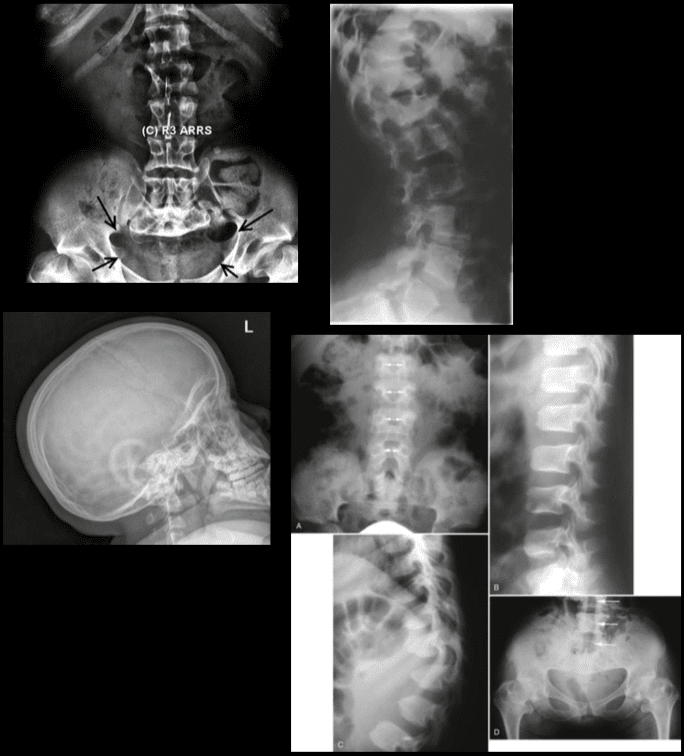 Most complications of Achondroplasia are related to the spine: vertebral canal stenosis, thoracolumbar kyphosis, narrowed foramen magnum and others. Laminectomy extending to pedicles/lateral recess with foraminotomies and discectomies can be performed. Imaging diagnostics play a fundamental role in the diagnosis the of scoliosis, an abnormality of the spine which is believed to occur due to an underlying health issue, although most cases of scoliosis are idiopathic. More over, radiographies, CT scans, and MRI, among others, can help monitor the changes of the deformity of the spine associated with this spinal manifestation. Chiropractors can provide imaging diagnostics to patients with scoliosis before proceeding with treatment. Scoliosis is defined as the abnormal lateral curvature of the spine >10-degree when examined by Cobb’s method of mensuration. Scoliosis can be described as postural and structural. Postural scoliosis is not fixed and can be improved by lateral flexion to the side of the convexity. Idiopathic scoliosis is the most common type (>80%). Idiopathic scoliosis can be of 3-types ( infantile, juvenile, adolescent). 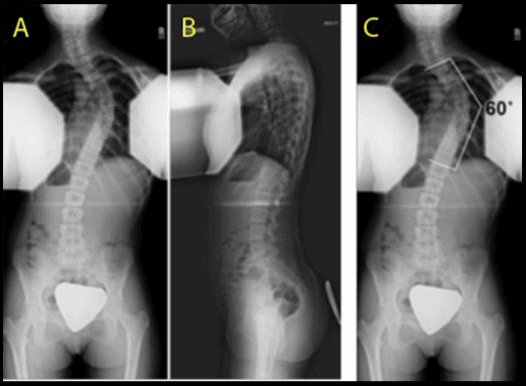 Idiopathic adolescent scoliosis if patients >10y.o. Infantile scoliosis if <3 y.o. M>F. Juvenile scoliosis if >3 but <10-y.o. 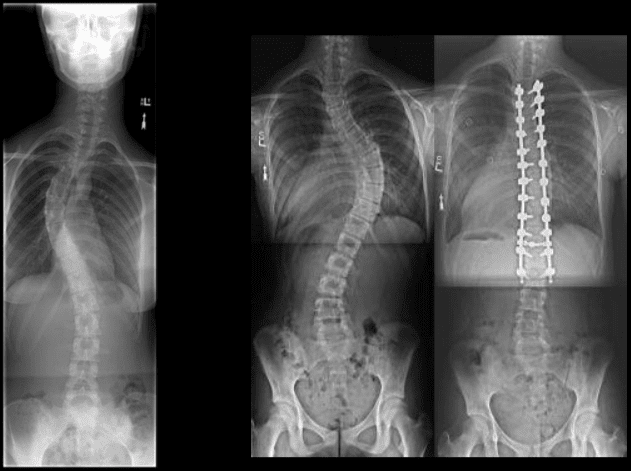 Idiopathic Adolescent scoliosis is the most common with F:M 7:1 (adolescent girls are at particular risk). Etiology: unknown thought to be the result of some disturbance of proprioceptive control of the spine and spinal musculature, other hypotheses exist. Most seen in the thoracic region and most commonly convex to the right. Dx: full spine radiography with gonadal and breast shielding (preferably PA views to protect breast tissue). • Curves that are 50-degrees or greater and rapidly progressing will require operative intervention to prevent severe deformity of the thorax & ribs leading to cardiopulmonary abnormalities. 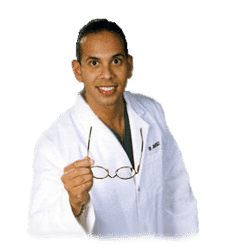 􏰀 If curvature is < 20-degree, no treatment is required (observation). 􏰀 For curves that are >20-40-degrees bracing may be used (orthosis). Boston brace polypropylene lined with polyethylene (right) often preferred because it can be worn under clothing. Bracing wearing is required for 24-hours for the duration of the treatment. 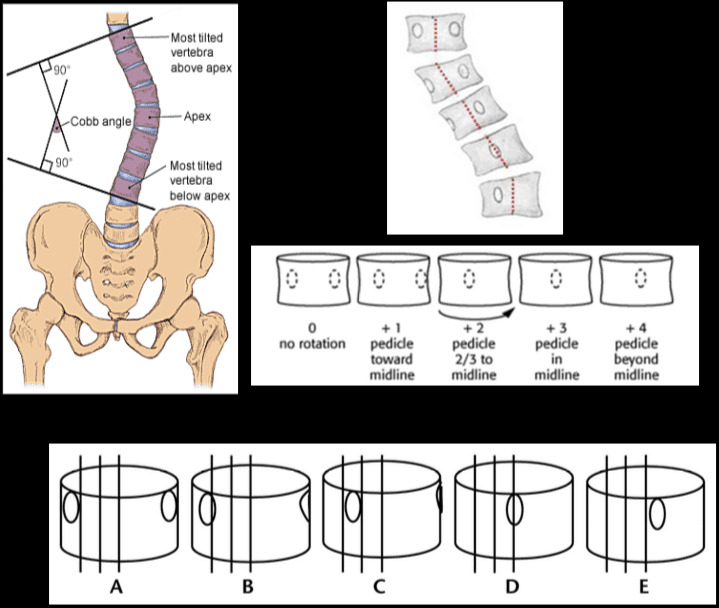 Note Cobb’s method of mensuration to record spinal curvature. It has some limitations: 2D imaging, not able to estimate rotation, etc. Cobb’s method is still a standard evaluation performed in Scoliosis studies. Nash-Moe method: determines pedicle rotation in scoliosis. Risser index is used to estimate spinal skeletal maturity. Iliac growth apophysis appears at ASIS (F- 14, M-16) and progresses medially and expected to be closed in 2-3-years (Risser 5). 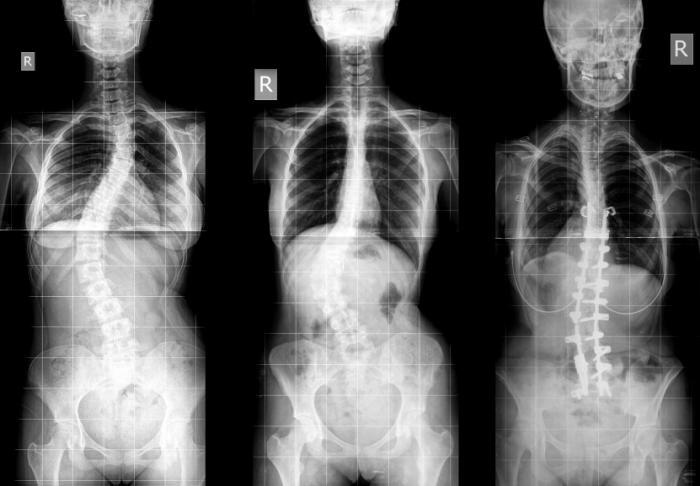 Scoliosis progression ends at Risser 4 in females & Risser 5 in males. During radiographic evaluation of scoliosis, it is crucial to report if Risser growth apophysis remains open or closed. Spondylolysis and spondylolisthesis are health issues which can result in back pain. Spondylolysis is believed to be caused by repeated microtrauma leading to stress fractures in the pars interarticularis. Patients with bilateral pars defects can develop spondylolisthesis, where the degree of slippage of the adjacent vertebrae can progress gradually over time. 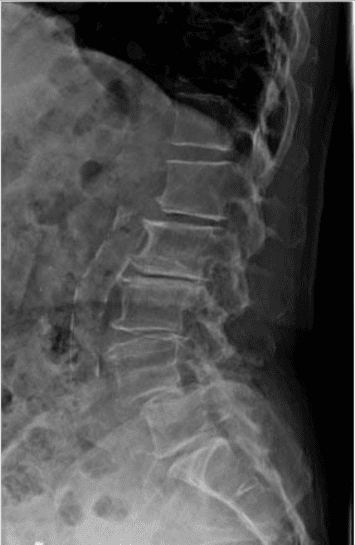 Patients with suspected spondylolysis and spondylolisthesis may initially be evaluated with pain radiography. Chiropractic care can also help provide imaging diagnostics for these health issues. Spondylolysis defect in pars interarticularis or osseous bridge between superior and inferior articular processes. Pathology stress fracture of the pars, believed to be after repeated microtrauma on extensions Men > Women, affects 5% of the general population especially in athletic adolescents. Clinically postulated that adolescent back pain cases may be related to this process. 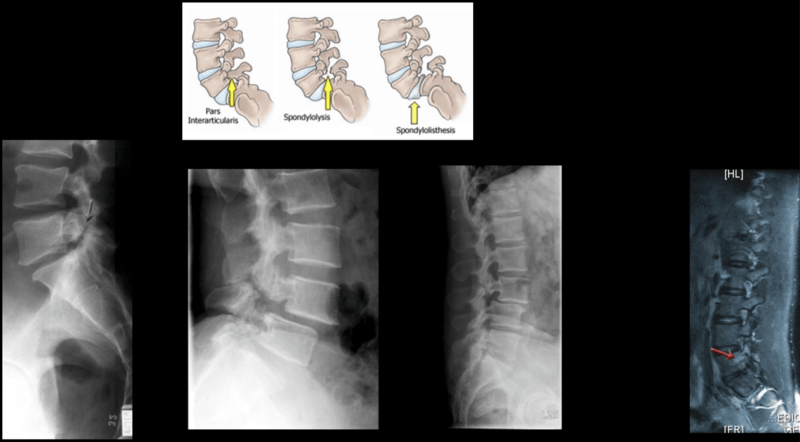 Spondylolysis can be present with or w/o spondylolisthesis. Spondylolysis is found in 90% at L5 with the remaining 10% in L4. Can be uni or bilateral. In 65% of cases, spondylolysis is associated with spondylolisthesis. Radiographic Features: break in the Scotty dog collar around the neck on oblique lumbar views. Radiography has low sensitivity compared to SPECT. SPECT is associated with ionizing radiation, and MRI is currently a preferred method of imaging diagnosis. MRI can help to show reactive marrow edema next to pars defect or w/o defect so-called pending or potential to develop spondylolysis. 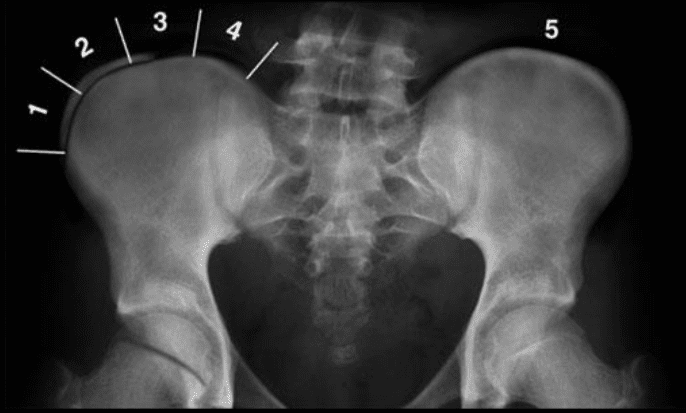 Type 1 – Dysplastic, rare and found in congenital dysplastic malformation of the sacrum allowing anterior displacement of L5 on S1. Often no pars defect. Type 2 – Isthmic, most common, often the result of a stress fracture. Type 3 – Degenerative from the remodeling of articular processes. Type 4 – Traumatic in an acute posterior arch fracture. Type 5 – Pathologic due to bone disease locally or generalized. Grading of spondylolisthesis is based on the Myereding Classification. This classification refers to the overhanging part of the superior body in relation to anterior-posterior part of the inferior body. Note degenerative spondylolisthesis at L4 and retrolisthesis at L2, L3. This abnormality develops due to degeneration of facets and disc with decreased local stability. Rarely progresses beyond Grade 2. Must be recognized in the imaging report. Contributes to vertebral canal stenosis. Canal stenosis is better delineated by cross-sectional imaging. 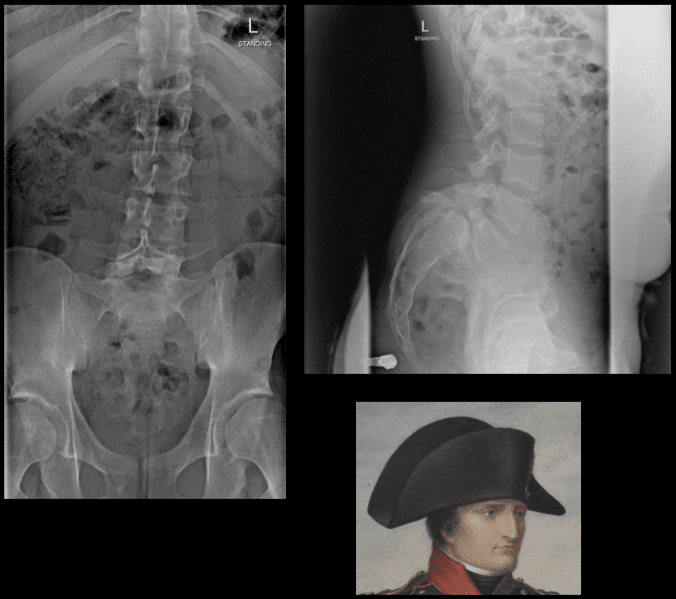 The inverted Napoleon hat sign – seen on the frontal lumbar/pelvic radiographs at L5-S1. Represents bilateral spondylolysis with marked anterolisthesis of L5 on S1 often with spondyloptosis and marked exaggeration of the normal lordosis. Spondylolysis resulting in this degree of spondylolisthesis is more often congenital and/or traumatic in origin and less often degenerative. The “brim” of the hat is formed by the downward rotation of the transverse processes, and the “dome” of the hat is formed by the body of L5. In conclusion, imaging diagnostics for the spine are recommended for patients with specific abnormalities of the spine, however, their increased use can help determine their best treatment option. Understanding the abnormalities of the spine described above can help healthcare professionals and patients create a treatment program to improve their symptoms. The scope of our information is limited to chiropractic as well as to spinal injuries and conditions. To discuss the subject matter, please feel free to ask Dr. Jimenez or contact us at 915-850-0900 .